MirC Wireless Contact Closure allows contact closure inputs to control relays in a remote location using a two board design. The sender board is equipped with contact closure inputs, used to control relays on the receiver board. 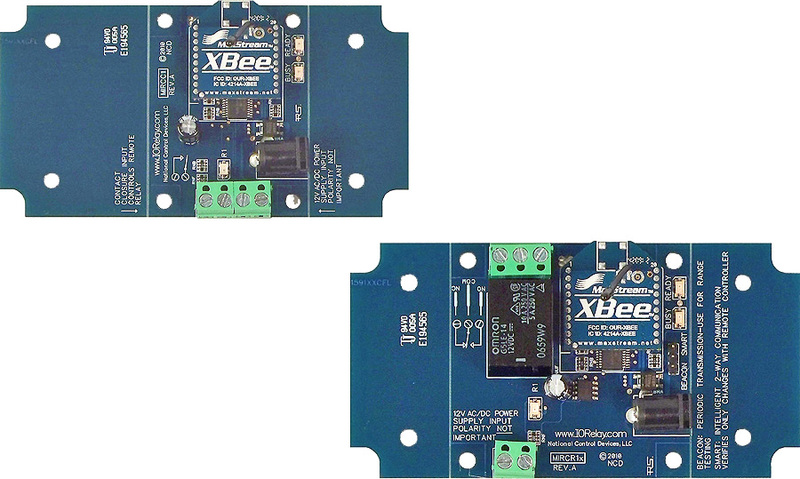 Both sender and receiver boards are included when you purchase a MirC pair. The relays on the receiver board can be used to interrupt the power of a device you are switching and also as a dry contact closure output. Applications where you need to extend the range of a contact closure over a distance the MirC will work. Connect the Contact Closure output of your device to the Sender Board then wire the relay on the Receiver Board as your contact closure input in a remote location. MirC boards boards below have four relays installed and four contact closure inputs. You now have your choice of 5, 10, 20 or 30 amp relay installed. A simple dry contact closure will connect to the input of the sender board and trigger a corresponding relay on the receiver board. These are sold as a pair and they are paired using the serial numbers of the radios onboard so multiple MirC boards will not interfere with each other. For more information on selecting the correct relay for your application see Choosing a Proper Amperage.